Last night's presidential debate between Hillary Clinton and Donald Trump drew in crowds by the masses. 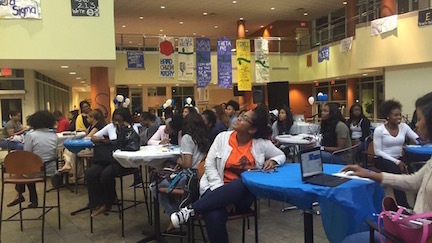 At Hampton University, students and administrators flooded the Student Center theater and atrium in order to view the nationally televised event and watched the two candidates charge head-to-head with their proposals. Some students were taken aback by the candidate's statements. "I couldn't believe when he compared us to the likes of a third-world country," said Devon Van Dyke, a varsity football player. Van Dyke said he was befuddled by Trump's statement, deeming it "disrespectful to the advancement of Americans." Some students and staff experienced different emotions after the debate concluded. Tracey Bumphus, a Chick-Fil-A employee at the Hampton U. campus, caught the tail end of the heated battle and observed what she called "absurdity" while listening to Trump in comparison to his female adversary. "She [Clinton] possesses class and seemed to choose her words carefully," said Bumphus. The next presidential debate on Oct. 9 will commence at 9 p.m. EST on Washington University's campus in St. Louis. Thirty minutes before first debate Monday night between U.S. presidential hopefuls Hillary Clinton and Donald Trump, Hampton University students filled the Student Center theater to standing-room-only capacity by 8:30 p.m.
Des'Tini LaGrone, a junior journalism major, Spanish minor from St. Louis, said, "I hope that a lot of students are tuning in, because this is not only affecting our future, but our children's futures as well." LaGrone said she focused on hearing about the candidates' views on student loan debt and education overall. The Greer Dawson Student Leadership Training Program and the Gamma Iota Chapter of Delta Sigma Theta Sorority, Inc. hosted, "Dissecting the Debate: Watch and Discuss." Representatives from Planned Parenthood urged students to remain informed and involved in this election. They also asked for volunteers for the Hillary Clinton campaign office in the Harbors Shopping Center. After having brief discussions with students, the televised debate from Hofstra University in New York began. The local hosts invited the crowd to tune in on Twitter using the hashtag #HUDebateWatchParty. Pearis Bellamy, a junior psychology major from Turnersville, New Jersey, and a member of the Student Leadership Program as well as Delta Sigma Theta, Sorority, Inc., said, "It is important for our students to be engaged and becoming informed about the candidates' opinions affecting us. We must be informed voters." Some students said they are anxious about this debate and the upcoming election, seeing that the stakes are pretty high. Daija Rivers, a sophomore kinesiology major from Philadelphia, said she started the "White Hall voter registration challenge" a few weeks ago. She started this challenge to encourage and inform students in her dormitory about registering to vote in addition to staying on top of the candidates. "Our generation has to understand that we have stepped into a debate that could make or break our future," said Rivers, "so voting and being mature during this time is vital." On Monday, Sept. 26, at 9 p.m., the first presidential debate between Hillary Clinton and Donald Trump will take place. CNN and other news networks will be streaming online and reporting live on cable TV. Students can watch the televised debate from Hofstra University in New York at the Hampton U. 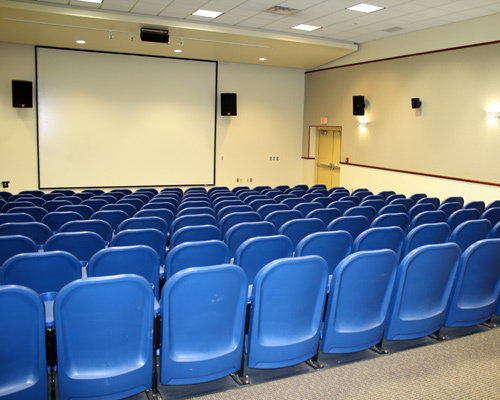 Student Center Theater, according to Anzell Harrell, director of student activities. In 2012, a standing-room-only crowd packed the theater for the Mitt Romney-Barack Obama debate. A number of Hampton University students have been active throughout the election – campaigning, registering students to vote and planning events to keep students informed on the election. Robel Eskinder, a sophomore nursing major from Los Angeles, works at the Hillary Clinton campaign office located in the Hampton Harbors shopping center near Hampton University. "My purpose for working on the campaign is to get students to vote," said Eskinder. "My essential goal is not to shift the votes of the students, but to just have students informed on what's going on in their backyards. I can be more personal with students than the other volunteers within the campaign, that's why I love doing it." An estimated 30 Hampton U. students are volunteering at the office of the Democratic candidate, and so are 20 Hampton city residents. When interviewing two interns at the Mariah Mingoes, a psychology major from Queens, New York and Democratic Coordination Office intern, said, "I really don't want Trump to be my president. His blatant ignorance is too unprofessional and I'll trying everything to make sure he doesn't get in office. Even if I have to dedicate hours asking everybody that walks by if they're registered." Anas'a Dixon, a political science major, Lorton, Virginia, said "Hillary is probably the most qualified candidate to run in history." 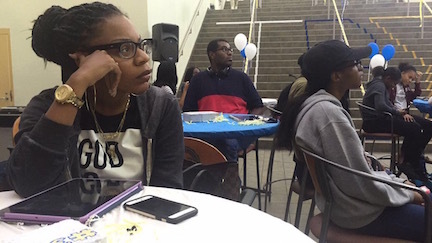 Delaria Ridley, a junior strategic communications major from Atlanta, and member of the campus Greer Dawson Wilson Student Leadership Training Program Student Leadership Program, said the organization plans stage a watch party in the Student Center Atrium. "The purpose of this event is to make sure that the campus has the opportunity to be informed and be able to provoke conversations about the upcoming election," said Ridley. "I can't wait to see Hillary do her thing!" said Jordan McKinney, a political science major from New Jersey. Daryle Kennedy and Chelsea Harrison contributed to this report. The writers are students in the Scripps Howard School of Journalism and Communications. This year's controversial U.S. presidential election have raised interest for many Hampton University students. Students that weren't concerned about being registered, or weren't of age to register for previous elections, have made it there priority to vote in the upcoming presidential election. Some young adults realize the importance of voting, and having a voice, no matter the political viewpoint. According to campusvoteproject.org, only 17 percent of young adults ages 18 to 24 cast ballots in the 2014 midterm Congressional elections. "1.7 million Americans between the age of 18 and 24 either don't know where to register," said the report, "or they simply miss the deadlines." Furthermore, although Millennial-age voter surpassed Baby Boomers as potential voting blocs, only 19 percent of 18 to 29-year-old voters participated in the 2012 presidential election, according to an NPR report. Baby Boomer participation was double, 38 percent. Although more students now realize the importance, not many of them take the necessary steps to make sure that they get registered. If they attend a college or university away from home, it can be a challenge to meet all the requirements in time. For that reason, many colleges and universities try to encourage students to get registered. Hampton University in particular provides a convenient way to register students on campus right then and there. Greek organizations on campus and members of the Student Government Association spread the word and promote the importance of voting. College students alone make a vast impact on which way the presidential race could potentially go. While others let the difficulty of voting and being away from home affect their decision to register, many Hampton University students, prefer to have their voices be heard. "Sheesh! I hadn't really thought about it," said Kayla Sellers, a junior broadcast journalism major from Queens, New York. "I'll probably go home to vote." Jorri Contee-Staten, a junior five-year MBA from Maryland said she planned on going home since she registered: "I'm going home Monday night [Nov. 7], and going to cast my vote the next morning." Other students that were interviewed were registered and planned to vote via absentee ballot or to travel back to their home states. Quadasia Walthour, a junior, political science major from Queens, New York, was registered in New York and planned to return home in November. Tatyana Stevens, a freshman computer information systems major, from Atlanta, planned to do the same. Sydney Shaw, a junior strategic communications major, is a Virginia native, and was excited about voting for the first time, in her home state. "As a first-time voter, I recognize the importance of this election," said Angel Bodrick, a sophomore biology major from Huntsville, Alabama. "To make everything a lot more convenient, I decided to vote in Virginia last semester." Kayla Collier, a junior kinesiology major from Atlanta, was registered at home, and plans to vote via absentee ballot, along with senior Khadijah Muhammad, a computer information systems major from Chicago. Channing Kirkland, a psychology major from Atlanta, said she was once told, "Absentee ballots are counted last and this election is nothing to play with. I want to make sure my vote is counted and counted first." Mecca Evans, Maya McCombs and Mararya Henderson contributed to this report. All writers are students in the Scripps Howard School of Journalism and Communications. A question that has been asked among Historically Black Colleges and Universities (HBCUs) for 148 years: who is the real HU?! 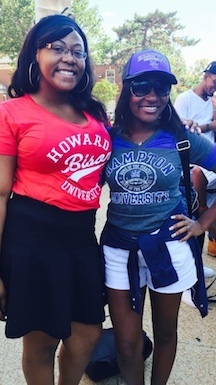 This rivalry between Howard University and Hampton University has been going on since 1868 – the year that Hampton was founded – one year after Howard. This weekend at RFK Stadium in Washington, D.C. marks one of the biggest annual HBCU events. Students, alumni, and many others attend the AT&T Nation's Football Classic –Hampton U. vs. Howard U. – too see which school can prove themselves as being worthy of the trophy, bragging rights, and the ultimate title of "The Real HU." Keauna Lenton, a Hampton U. freshman pre-pharmacy major from Detroit, is traveling to our rival school on one of the six charter buses provided by the Office of Student Activities here. This form of transportation was convenient for many students as their $40 package included transportation to and from Washington, D.C., a T-shirt, and a boxed lunch. Some upperclassmen students said the downside of traveling with the Office of Student Activities was that it is a turnaround trip. Genita Johnson, a sophomore marketing major from Boston, is driving to the game with friends and staying in D.C. for the weekend so that she can get "the entire HUHU experience," she said, a reference to the social aspects of the weekend. Friday, at 1 p.m., launched the rivalry. The "Game Before the Game: Howard University vs. Hampton University Student Debate" was to take place in the Cramton Auditorium on Howard's campus, where members from both schools' debate teams would go head to head in three rounds of intense debating on pre-determined topics while they're being cheered on by their fellow Bison or Pirates in the audience. Students, alumni and others from schools all around will likely be traveling late Friday or early Saturday so that they can make it to the Pepsi Block Party, or tailgate on the festival grounds of RFK Stadium on Saturday beginning at 11 a.m.
"I'm not into the football aspect of HUHU, but I'm looking forward to the tailgate and seeing my fellow Howard students," said Tanasia Smith, a junior journalism major from Harlem, New York. The tailgate will be full of students and alumni from the HU's, Greeks, celebrity guest. The reality is, you never know who will pop up at these events. Lauren Smith (pictured above, right), a sophomore health science major from Detroit, attends Howard and is all about socializing this weekend. She plans on attending the tailgate and any and every party succeeding the game. Besides, what's a college weekend without a friendly rivalry and parties?! Rivalry aside, one thing that Hampton and Howard students do great together is PARTY. We are both known to work hard, but play hard as well. One of Hampton's own, QT9's Cameron Benboe, better known as DJ Camo, will be hosting and DJ'ing one of the after parties on Saturday night. The rumor around social media is that there will basically be a party at every corner, so if you like social functions, D.C. will be the place for you this weekend. One thing is for sure, this weekend will be an interesting, but when it's all said and done, only one school can walk away with the title of the REAL HU. The question is, who will it be? On Wednesday and Thursday, Hampton University's Majestic Dance Troupe will host its annual tryouts in the Student Center atrium. Students will rehearse Wednesday night starting at 5 p.m. and audition on Thursday from 5 to 8 p.m. Majestic dance captains will teach the choreography to two songs Wednesday which will then be performed during auditions Thursday. Students must submit applications, including headshots. Once they learn the choreography, they are allowed to choose their best number for the audition before peers and faculty. For years, the Majestic Dance Troupe has performed at Hampton University and off campus. They contribute entertainment, school spirit, and inspiration to the regional dance scene. Students and residents of Hampton, Virginia, speak highly of the dance team. "The Majestic team is dope man. I've always wanted to be a part of them," said David Baker, a Hampton resident. "They look like they have a lot of fun. Their choreography is lit." The captains of Majestic ­– Justin Jones, Chloe Harper, Amaiyah Beverly, and Khalil Harris – are working hard to make the troupe even better this year. "Being the captain of such a well-known organization makes me feel proud," said Harris, who promised great things out of the auditions. "I guess everyone will have to wait and see what we have in store." The anticipation for new talent is high this year, the captains said, urging those who love to dance to give it a try. 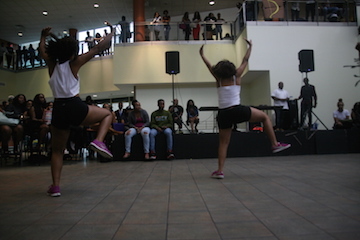 Note: The Majestic Dance Troupe on Sept. 15 inducted 62 new members out of 80 people who auditioned during annual tryouts in the student center atrium. NORFOLK – Hampton University students may have a lower debt from college if they vote for Hillary Clinton in November, according to the Democratic vice presidential nominee, Sen. Tim Kaine. Friday, Kaine promised a crowd at Old Dominion University that the first phase of lowering student debt would be rolled out in the first 100 days of the new administration. 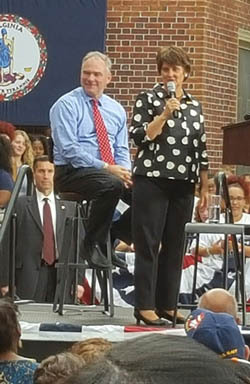 "We are at a point where student loan debt is higher than credit card debit in the United States," Kaine said during the open-air rally outside Rollins Hall on ODU's campus. "Hillary and I have a vision of debt free college. It is a goal but a very big goal ... to support students furthering their education." Kaine and his wife Ann Holton were greeted by cheers while "Ain't No Mountain High Enough" rang out as they walked out onto the platform. Holton opened the program talking about the powerful women who have supported her husband and how much he appreciates their support of the Clinton campaign. "Payback is great," Kaine responded. "This is the best way to honor all the woman that have supported me." Dozens of volunteers handed out water, registered people to vote and asked the audience to work with the campaign. Security was high as about 300 attendees followed a path down toward the mainstage. Numerous local, regional and state politicians were present. Karla Grase, Co-Chair of the Hampton Democratic party, started things off at 5 p.m. with an acapella version of the national anthem. Congressman Bobby Scott, who is vying for Kaine's Senate seat if he wins in the general election, urged the crowd to fight for Clinton and Kaine. "If we do what we are supposed to do and carry Virginia the Republicans will have to win states they haven't won in three decades," Scott said. Kaine also talked of the work Democrats have ahead of them, urging supporters to volunteer, then criticized Donald Trump, saying Americans want "Dictatorship not leadership." The audience cheered when Kaine said that "someone who cannot pass a fifth grade civics test should not be allowed to be the president." Kaine went on to discuss the current state of the economy, our international allies, foreign relationships, and charity. He compared his work with ODU as a senator and a member of this community to the lack of charity. Kaine urged the crowd to get out in their communities and talk about the campaign because television commercials no longer have the impact they once did. "People will always listen to their friend or neighbor," Kaine said. Other speakers included Norfolk Mayor Kenny Alexander, Lt. Governor Ralph Northam, members of the armed forces and President John Broderick of ODU. Kaine closed by saying "Democrats are underdogs. Let's make history." NEWPORT NEWS – At the 40th annual Robert C. "Bobby" Scott Labor Day cookout, supporters around the Hampton Roads area came out for a meet-and-greet-style gathering hosted by Virginia's 3rd Congressional District representative. This yearly event is used to rally support for upcoming elections. With this year's presidential elections approaching this November, this event amplified the support of Democratic presidential candidate Hillary Clinton and running mate Tim Kaine. With Kaine, a U.S. senator from Virginia, in the running to become vice president, questions have been raised to see who could fill his seat, if Kaine advances. There has been speculation that Scott could be the replacement. Matthew James, a member of the Virginia House of Delegates representing Portsmouth, said, "If anyone deserves the senator's spot, it's him." James also stated that he has sent out letters to other elected officials on Scott's behalf, recommending that he fill in that office. Richard Miller, a senior labor policy adviser, who works alongside Scott on the education and labor committee in Washington, D.C., said, "The thing that Congressman Scott has over everybody else is that he is very, very principled. He's a scholar. He sticks to what he thinks is right, then he researches how to make those things happen. "I would know. I'm the one he emails at three o'clock in the morning to look over things." The arrival of football season at Hampton University is apparent: The band can be heard practicing late nights, the cheerleaders rehearse their cheers and chants, and football players and coaches spend countless hours on the field. The season opener will be 3:30 p.m. Sunday at Old Dominion University as the Pirates take on the Monarchs [The original 6 p.m. Saturday kickoff across the harbor in Norfolk was changed because of anticipated heavy rain – 3 to 6 inches – from the remnants of Hurricane Hermine]. Will Hampton University students be in attendance? "Now that I'm a junior and have transportation, I'm willing to travel and support my friends on the cheerleading and football team at away games," said Arie'yana Easterling, a third-year psychology major from Durham, North Carolina. "Hampton needs more people to travel and support the team." Freshman Rhian Elyse of Houston hopes the game atmosphere matches the invigorating culture of Texas high school football: "I'm so excited to a part of the fan club and cheer for our team." 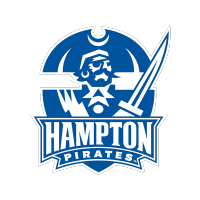 Timia Whitsey, a sophomore from Houston, said, "I will be in attendance with the Student Leadership Program, so of course we will be sure to have the [people in the] stands cheering and screaming our favorite chants as we show why we love our Hampton Pirates." Hampton's win-loss record was 6-5 last season and the team is 0-4 lifetime against ODU. The last time the Pirates played the Monarchs was 2 years ago and the game remained fairly close until the last quarter, in which ODU beat the Pirates 41-28. "I would be interested in going to this game because both schools are close, and I might see someone I know," said Benjamin Faulks, a freshman accounting major from Portsmouth. "But I wasn't able to get a ticket because they sold out so fast. I'm disappointed." Two-hundred-thirty tickets, according to the campus sports information director, went on sale Aug. 15 and were priced at $31 apiece. Unsold tickets were returned to ODU, which has sold out the last 48 games at 20,118-seat Foreman Field at S.B. Ballard Stadium. Arianna Herriott and Jordan Parker contributed to this report. The students are majors in the Scripps Howard School of Journalism and Communications. On Aug., 24, the Scripps Howard School of Journalism and Communications team was on set at the Xiaoshui River in Yongzhou to pay respects to Chen Shuxiang, commander of the 34th Red Army Division. In October of 1934, the 29-year-old was appointed to lead a 6,000-member force that trudged to the historic city to provide relief for beleaguered soldiers crossing the river there. The event was known as The Long March, a 368-day campaign that covered 6,000 miles, nearly twice the distance between New York and San Francisco, noted History.com. Information retrieved by Hampton student correspondents from search engine baidu.com provides this narrative: By the time the commander arrived, Shuxiang's force had been cut down to 1,000 men. When they tried to cross the river, they were ambushed, and Shuxiang was captured after being wounded in the torso by a bomb. Upon realizing they had captured a high-ranking official, enemy forces were ecstatic and offered treatment. Knowing the gesture was only an attempt to extract information, Shuxiang refused such treatment and purposely ripped his intestines out, killing himself. His head was later cut off and hung to intimidate oncoming forces. Locals would later bury his headless body inside Dao County where today people visit his cemetery to pay respect to his legacy. 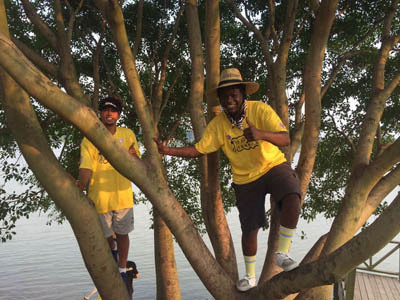 China has already proven itself to be a true experience for Hampton University students. As a team of three works its way through the vast mountains and forests, they can only hold tight to their cameras in anticipation for what will happen next.